Rubber is a material that is critical to modern industrial civilization, with applications surrounding us everywhere; yet rubber is probably the least understood material that engineers use. The most notable application of rubber occurs in modern transportation, which relies entirely upon rubber tires for propulsion, whether by truck, car, motorcycle, or bicycle. Rubber is the ideal material for this because of its ability to accomplish multiple critical functions simultaneously: sealing the pressurized cushion of air that softens our ride; providing an extremely flexible and durable membrane to contain this air so we can realize the benefit of the cushion; and offering high surface friction to give the vehicle traction for propulsion, steering, and braking. The engineering definition of a rubber material is “any material that can stretch to at least 100% of its original length, and return to its original shape without permanent deformation”. Although the term “rubber” originated from true natural rubber derived from trees, today the term is used to refer to a host of different engineering materials, most of which are synthetic, and all of which exhibit the hallmark flexibility of natural rubber. Although engineers may employ many other options to achieve any of these purposes, rubber often performs with greater elegance and lower total cost than the alternatives, and certainly with the highest degree of flexibility. In addition, rubbers can be molded into extraordinarily complex configurations, and can be bonded to virtually any substrate material to form a composite component, greatly enhancing the engineer’s ability to tailor a component’s function. One reason that most engineers know so little about rubber is its complexity. Rubber is the most complex material that an engineer can draw upon, and its very complexity gives rise to its flexibility. The first level of complexity is the molecular nature of rubber itself: rubber polymers possess the highest molecular weights and longest chain lengths of all substances. This sheer size and length allows rubber molecules to bend and flow with extreme freedom, and it is this microscopic movement that translates into macroscopic deflections that are 10 times greater than any other materials. Another level of complexity arises with actual rubber formulations themselves, which are much more complex mixtures of ingredients than other engineering materials. For example, metals are usually alloyed from perhaps 2 to 4 elements; plastics are usually blends of 3 or 4 materials. By comparison, a typical rubber formulation is usually composed of 10 – 20 total ingredients, all of which must be carefully selected and apportioned to modify the final properties. The final and defining complexity of rubber is its thermosetting nature. To manufacture a rubber component you must heat the rubber for sufficient time to cause an irreversible chemical reaction that involves many of the ingredients, a reaction that transforms the rubber’s properties to make it permanently flexible and useful. In the case of metals and plastics, only phase changes occur, “thawing and freezing” of the materials, in a sense; this makes for reasonably predictable behaviors among the few constituents that are blended together for these materials. Because rubbers are composed of so many different ingredients and involve chemical reactions between many of these ingredients, there is a level of complexity and unpredictability that can defy analysis. There are simply too many variables at play! In selecting a rubber for any given application, it is important to understand the range of options available. Much like plastic, rubber has a large variety of polymer families that each have their strengths and weaknesses. For example, some rubber polymers excel at resistance to aggressive fluids, but may have severe limits on low temperature flexibility; others offer excellent performance from very low temperatures to very high temperatures, but have limited durability and ruggedness. Engineering trade-offs abound. And within these broader polymer families there are further subdivisions of specific polymer varieties that can greatly influence performance properties. 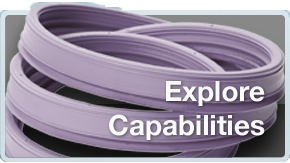 This variety of potential polymer inputs offers the engineer a broad range of possibilities. 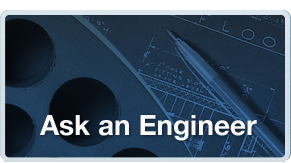 The challenge comes in understanding the fit between all of the possibilities available and the specific application; to optimize performance requires careful selection among the options. The large number of variables that come into play makes the design of a rubber formulation a very complex exercise with a much lower degree of analytic predictability than in the case of metals and plastics. Ultimately, the design of an optimal rubber formulation owes much to the pragmatic “art” of an experienced practitioner. In seeking to optimize an application, the most critical task is to define the application goals and the operating environment as clearly as possible. One should start by defining the primary and secondary mechanical goals for the rubber component. Is the component going to seal up fluids? Conduct fluids? Will it need to store and release energy? Will it simply transmit energy? Is energy absorption a goal? Will the rubber need to provide structural support in an assembly? Most applications require multiple mechanical actions, and one of the beauties of rubber is its ability to address multiple needs in a single, compact package. This often makes rubber the best choice for the engineer. In order to ensure proper performance and long life, it is important to understand the environment in which the rubber component will operate. The selection of rubber formulation can be severely constrained depending upon the combination of conditions. Things to consider are: the temperature range in application; any material exposures (oils, fuels, coolants, ozone, solvents, etc. ); any radiant exposures (radiant heat, sunlight, UV, corona, etc. ); the forces encountered (whether load determined or deflection determined); and the pressures present. The more accurately this can be characterized and quantified, the greater the chance of success in hitting the design goals. An especially challenging subset of applications involve dynamic cycling of rubber. Dynamic cycling requires rubber to repeatedly flex through a range of motion, for which rubber is typically well-suited; but repeated cyclical flexing can create fatigue cracks that may ultimately cause the failure of the rubber. For dynamic cycling applications, it is important to define the dynamic requirements: the expected frequency spectrum; the anticipated deflection amplitude or loading that will be transmitted; and whether start-up or shut-down events will pose particular challenges (due to the driving machine passing through its critical frequency). Design for dynamic applications pushes the rubber art to its greatest limits, and requires the greatest care in characterizing the application and in developing the optimal rubber formulation to meet the challenge. In developing a formulation, it is not uncommon for a number of different mixtures to be created and tested before arriving at an optimal solution. Temperature stressing, fluid immersions, elongation testing, tensile strength, tear resistance testing, abrasion resistance testing, flex-cycling, ozone aging, and weathering can be performed in a lab and give some indication of the formulation’s performance. However, very often only testing that duplicates field conditions can be trusted to determine the ultimate acceptability of the formulation. Specifying a rubber material for an application can be much more challenging than specifying metals or plastics. Compared to most metals and plastics, rubber formulations are truly “non-standard”. Unlike 1018 steel or Nylon 66, which are universally available and documented commodities, a rubber formulation is proprietary to the given manufacturer that developed it, and therefore not broadly available. As applications become more challenging, the abilities and experience of the formulation chemist become more important, particularly when dynamic cycling is a dominant feature. For such critical applications there often is no viable universal specification to list on a drawing (e.g. ASTM line callout, etc. ), and the engineer’s only option may be to specify the actual proprietary rubber formulation that has been proven in application. 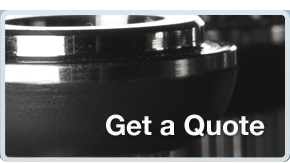 Given the range of options available and the complexity of rubber materials, the best approach to designing with rubber is to involve an experienced rubber engineer as early in the process as possible. They stand the best chance to guide you through the varied and complex world of rubber. In the end, this will likely save you time and money, while also creating a superior product.